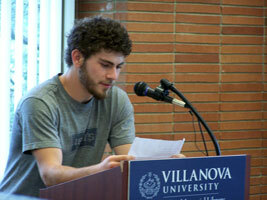 Joey Bagnasco reads "A Sunday"
Stanley Kunitz’s poem, “The Portrait,” provided a dramatic beginning to the seventh annual Open Mic Poetry Reading on April 24. Lisa Sewell, PhD, an associate professor in the English Department and also the director of programming, Gender & Women’s Studies, began the poetry reading with “The Portrait” and also “The Long Boat” by Kunitz. Dr. Sewell introduced senior class member Kathleen Pierce. Kathleen presented the just-released 2012 issue of Arthology, one of University’s student literary-art journals. Editor-in-chief of and a contributor to Arthology, she made copies of the journal available to attendees. Kathleen also shared her poem, “Commuter’s Daydream.” Ahren Potratz came to the microphone next to read “In a Wheatfield in Auvers-sur-Oise.” And Ciara Sprance presented “Naturalism.” Arthology features all three of these poems. Meghan Farley, a Senior Class Poet contestant, presented “Secrets.” Barbara Quintiliano, instructional services librarian and team leader for Life Sciences/Nursing, read “Disarmed.” Senior Class Poet contestant Ashley Dunbar shared “You Came, Too” by Nikki Giovanni, and Alicia Hobson delivered “Cat Calls” by Anonymous. Ravahn Duval presented “One Day,” which appears in Arthology. Melanie Romero shared “The Pietà.” Melanie’s selection as Senior Class Poet was announced at the English Department awards ceremony on May 4. Jacqui Kelliher read “The Green Eye of the Little Yellow God” by J. Milton Hayes. Dr. Sewell concluded the event with her own poem, “Murder on the Orient Express.” The Open Mic Poetry Reading showcased the students’ imaginative creativity and skill. And Dr. Sewell’s obvious passion for promoting poetry made this well-attended event a success. Set in the new Speakers’ Corner of Falvey Memorial Library, the event was co-sponsored by Falvey and the English Department. Other organizers included Dierkes, Judy Olsen, graphic designer Joanne Quinn and Falvey’s Events & Outreach team. Dr. Sewell handles the Senior Class Poet competition on behalf of the English Department.